The Cooking Mama series has been around for a while now, and has largely endured thanks to its simple (and often addictive) gameplay, and it’s cute, often irresistible charm. The series’ newest entry, Cooking Mama: Sweet Shop on the Nintendo 3DS, puts an emphasis on players opening their own bakery, and trying to make the best sugary sweets to attract customers. Cooking Mama: Sweet Shop continues the series’ mini-game-based gameplay and, following in the series’ long history on consoles such as the Wii and Nintendo DS, makes good use of the 3DS’ hardware. Unfortunately, those who are familiar with the series may not find a whole lot of newness in Sweet Shop, and while some of the mini-games are fun and accessible, others are a bit harder to figure out. As stated, the goal of Cooking Mama: Sweet Shop is to make the best sweets around, and gradually build-up your bakery to gain more and more customers. 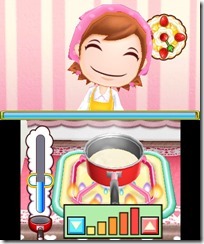 Along the way, the player is aided by Cooking Mama, the adorable, cartoonish namesake of the series. 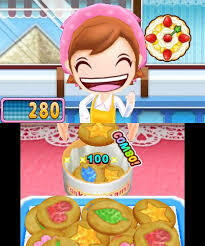 In order to create the baked goods, players need to complete a short series of mini-games, which each use the touchscreen and mic of the 3DS in unique ways. Some mini-games may have you swiping the touchscreen to spread chocolate on a cannoli, while others will have you pouring flour in a dish by tapping its side, while taking a break every time the wind blows in from an open window (if this happens, you’ll have to blow into the 3DS mic to clear the screen of flour). Other games may have you dropping ingredients into a bowl and stirring them, followed up by placing them in an oven and getting the temperature right to make cookies. For the most part, the mini-games are simple and fun, and it’s great that you have to go through a series of them in order to make a single dessert (earning medals for your performance in each mini-game). The more desserts you make, the more new desserts you unlock, some of which may share a few mini-games with others, making the game something of a test of memory as well reflexes. On the downside of things, there were a few mini-games that I simply couldn’t figure out. You only get brief descriptions of each mini-game beforehand, and due to the general simplicity of the games, that’s usually enough. But there were a number of mini-games that are slightly more complex (having to act fast and perform specific actions for different ingredients in succession). And in these cases, the short descriptions just weren’t very helpful, making the games themselves cryptic and confusing. On the bright side, such games are in the minority, but it does make it jarring when you go through a number of simple, easy mini-games, and then end up doing one you can’t get right because you can’t figure out what to do. Still, once you start making a series of sweets and your shop starts stocking up, it’s fun to see more and more customers coming in. And the more customers you gain, the more you can customize the shop itself. It’s really simple stuff, but Cooking Mama: Sweet Shop is fun, and it’s one of the more charming mini-game compilations to come around in the post-Wii generations. Aesthetically, the graphics are simple but colorful, and the sounds are cute (I especially like Cooking Mama’s thick Japanese accent, which somehow makes the game even cuter). Though they also don’t really look much different than any of the Cooking Mama games that came before. Cooking Mama: Sweet Shop is good, simple fun, if maybe not anything you haven’t seen before from the series, and when the mini-games don’t work, it feels entirely conflicting from the game’s otherwise accessible nature. But if you’re new to the series or just can’t get enough Cooking Mama, then Sweet Shop at the very least provides some entertaining mini-games and some addicting customization elements.